There’s no denying the fact that finding dental plans for seniors at an affordable cost that offer good benefits can be extremely challenging. Of course, there are commercials on television that offer low cost dental health plans for seniors and there are also several offers for cheap insurance online to choose from. However, the thing that most people don’t realize is that the vast majority of these offers provide very little coverage and even less immediate coverage! Let’s take a look at the two most popular types of dental plans. Once you’ve read this you’ll have a much better understanding of how these plans really work. Then you can decide which best fits your needs. Important: Read this entire page! You should always read the fine print before buying any type of dental insurance policy until you find the word “exclusions”. Exclusions are things that the policy will NOT provide coverage for and I can almost guarantee you that one of the first things you’ll find under that listing is “pre-existing” conditions. Dental insurance policies will NOT pay for pre-existing conditions until you’ve owned the policy for a minimum of one year. This is what’s known as a “waiting period”. In the case of senior citizens, most of you need to see a dentist right away for a problem that you’re having right now. Unfortunately, insurance won’t help you with that. The positive thing about dental insurance is that you CAN be seen for routine check ups, get x-rays and find out what needs to be taken care of. Most check ups, cleanings and other minor care are covered with this type of plan. However, you will still be responsible for paying a co-pay at each visit to the dentist and for paying your annual deductible before you begin to get the full benefits of the plan, just as with any other type of insurance policy. The negative thing is that you’ll be required to pay the full cost for anything that must be fixed immediately. This is because it would be a new plan and you haven’t gone through your mandatory waiting period yet. In addition, if you need dentures a standard dental insurance plan won’t cover that at all. You must purchase a specific plan for dentures only. This plan is only good if you need dentures sometime in the future – not if you need them immediately. These plans have an average annual limit of approximately $1000.00 per individual and up to $3000.00 per family. Click The Banner Above To Enter Your Zip Code. Don’t Forget To Mention Coupon Code JE10 When You Enroll! This Will Save You An Additional 10% Today! Many seniors have found discount plans to be a great alternative to buying insurance. The reason for this is because all these plans do is offer significant discounts at participating dentists. They are not insurance at all, therefore, there is no mandatory waiting period! You simply enter your zip code and find out if there’s a plan available in your area and a participating dentist in your area. This is usually not a problem as there are over 100,000 participating dentists nationwide. You find a plan that meets your needs and enroll. Don’t worry. These plans are very affordable. As a matter of fact, some plans start as low as $79.95 per year for an individual. Once you’ve received your membership information you simply call a participating dentist in your area and make an appointment. Go to your appointment and get a general exam. You’ll only be required to pay the discounted rate at the time of your visit. This way your dentist will be able to tell you exactly what you need to have done. Decide what you can afford to pay for at that time and get the things done that are within your budget. If you can afford to have it all done that day, great! If not, get some things taken care of that day and come back next month for more. Simply pay as you go. You’ll pay from 10% up to 60% less than you would without the plan AND, most importantly, you’ll be able to get a BIG discount on work that was being denied to you by an insurance company! Change Dentists Within The Network Anytime You Like! See a Dentist Within 1-2 Business Days! 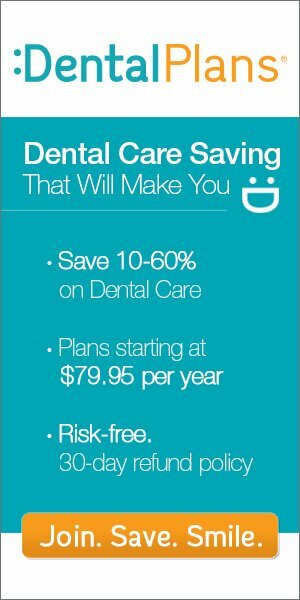 Save between 10% and 60% on dental care. This includes dentures, braces, crowns, bridges and much more. Get more information about Discount Dental Plans For Seniors Today by either giving us a call Toll Free at 1-855-214-7725, Entering your zip code within the blue banner above (where the pretty young lady is) or simply click here. Important: Don’t Forget To Mention Dental Coupon Code JE10 As This Will Save You An Extra 10% On Your Enrollment!